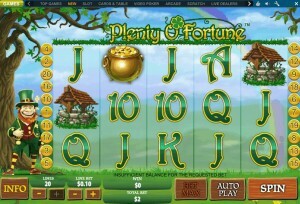 Plenty O Fortune is a new themed slot from Playtech. 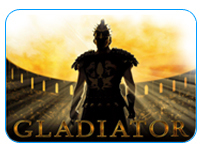 It began being offered in online casinos in July of 2013. The theme of this game, “Irish Luck”, has been done and redone many times, but Playtech manages to breathe new life into it, with a dynamic game-play and unique bonus rounds. What’s certain is that you don’t have to rely on luck alone to win in this game; Plenty O Fortune offers plenty of winning opportunities. Read this review to find out more. The theme of Plenty O Fortune, as the name suggests, is Irish Luck. The main character of this game is a whimsical Irish Leprechaun. The symbols on the reels include a series of luck related icons, such as a Wishing Well, a Rainbow and a Pot O Gold. The traditional Irish music playing in the background completes the theme. Plenty O Fortune is a 5-reels, 3-rows, 20-lines video slot. The aim of the game is to complete a combination of 2-5 like-symbols appearing from left to right across an active pay line. Normally, symbols must appear on adjacent reels to create a winning combination. The exception is the Scatter symbol. 3 or more Scatter symbols appearing anywhere on the reels constitute a winning combination. While this is pretty much standard, while most games offer one scatter symbols, Plenty O Fortune offers 3 scatter symbols, awarding instant wins and access to special bonus rounds. In addition, the Rainbow is a Wild symbol and can take the place of all regular game symbols to help complete a winning combination. There is also an “Auto Play” feature in Plenty O Fortune, which plays the game automatically for the selected number of rounds. 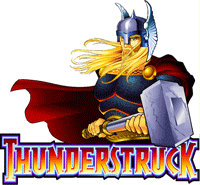 This video slot offers 20 Paylines. The number of lines is not fixed, and you can choose how many lines to activate. The number of active lines can be changes at any time. The betting range of this slot is wide. You can bet anywhere between $0.01 and $5 per line, with a maximum bet of $100 per spin. You have complete control over your bet amount during the game. The number of active lines, bet per line and total bet per spin remain displayed on the screen throughout the game. Max Bet will automatically play the game with the maximum number of pay lines and the pre-chosen bet level. Plenty O Fortune offers an impressive set of unique bonus features. 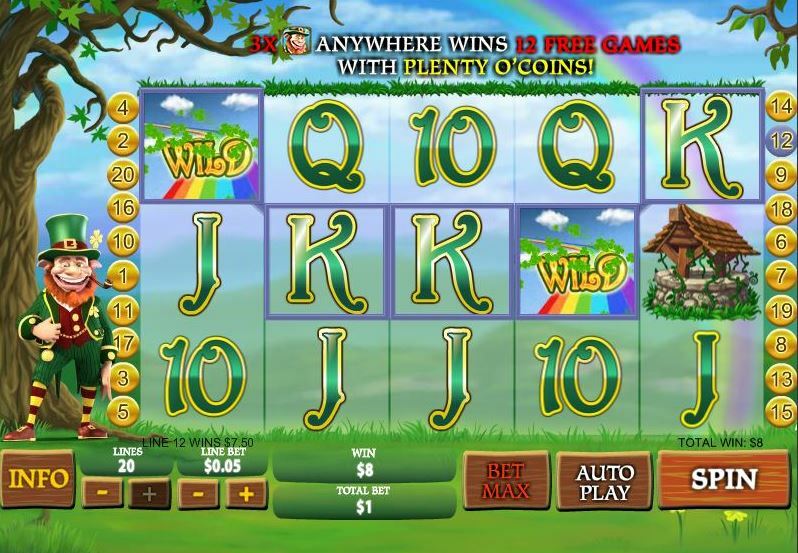 Free Games – 3 Irish Leprechaun symbols anywhere on reels 2,3,4 in the main game will win you 12 Free Games. Free games are played in much the same way as the main game, except 3 special coin symbols (bronze, silver and gold) are added to the reels. These special coins award instant wins. Depending on the coin, you can win up to 5 times your original bet. 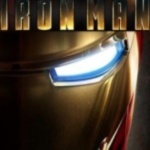 Free Games cannot be retriggered and other bonus features cannot be triggered during free games. 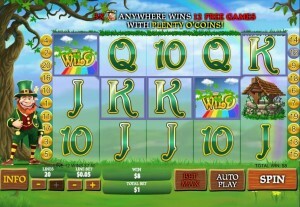 Wishing Well bonus – 3 Wishing Well symbols anywhere on the reels trigger the Wishing well bonus feature. A rainfall of coins pours out of each well and collected by the Leprechaun. The total bonus prize is counted on a special meter presented at the top of the reels. If you get more than 3 Wishing wells, your bonus prize is multiplied, up to 10 times the average prize if you get 5 wishing well symbols. End of the Rainbow Bonus – in this unique bonus game, the Irish Leprechaun advances along a path up the mountain. With each turn in the path, you can collect additional instant wins, unless you hit a “collect” sing which ends the game. The prized grow as the Leprechaun advances up the mountain. On the top of the mountain, a huge Pot O Gold awaits the Leprechaun with another cash prize. Plenty O Fortune is not a progressive slot game. The top fixed jackpot according to the Paytable are $50,00 by getting five Wild Rainbow symbols on a payline and the next highest payout is $25,000 for 5 Plenty O Fortune logo symbols. However, the Rate of Return to Player in this game is relatively low, and stands at 91.95%.